Google has now purchased over 3 GW of renewable energy, followed by Facebook (2 GW), and Microsoft, Amazon and Apple (1 GW each), BNEF told Bloomberg. 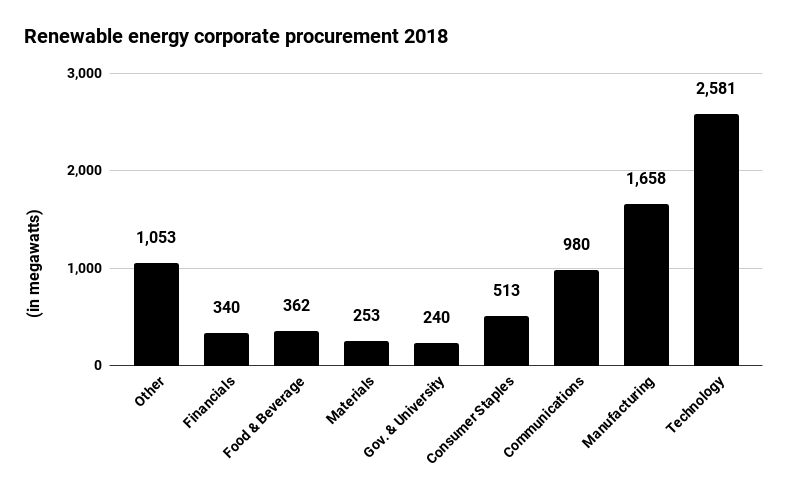 The firm's data showed the tech sector leading the year with renewable energy corporate procurements. There are 25 billion devices connected now, "and the numbers are expanding exponentially," Richard Mroz, senior advisor of state and government relations for Protect Our Power, said. And IHS Markit expects estimates data centers account for between 2% and 3% of electricity demand in developed nations, primarily for cooling. "Onsite generation is the ideal way to implement renewable energy in data centers," the firm said. But it added that offsite renewable energy sources like utility companies and renewable projects "are typically the easiest way for data centers to obtain renewable energy. Offsite generation removes the large upfront capital expenses to produce onsite renewable energy and the geographical limitations of renewable energy production methods." "The deployment of cost-effective, large-scale energy storage could conceivably help create better matching of renewable energy supply with data center electric demand, particularly over the course of a day," Google wrote in its renewable energy analysis. But it added, "storage may not necessarily be able to overcome major seasonal variations in renewable supply."